Go GREEN - Use Cedar!! Lead times may vary due to size of order. We do try to keep most items in stock. Please call for availability. White cedar wood is light, soft and fairly uniform in texture. Cedar has the US Forest Products Laboratory highest rating for decay and disease resistance. For this reason it is used in log homes, fence posts, canoes, shingles, decks and other structures that are exposed to water and soil. The fresh cedar odor is a mild insect repellent. Cedar, over time, will change to a silver gray color if not treated. Water-based or oil stains will delay the weathering process. Latex paint coats fairly even and lets wood breathe. 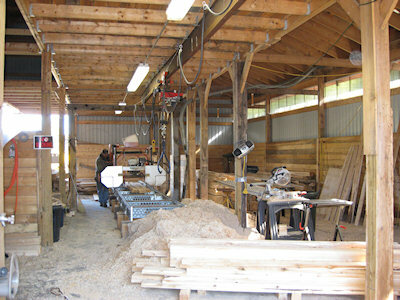 copyright © 2009-2017 Cedar Sawmill of Vermont.